We’d love your help. Let us know what’s wrong with this preview of Eleven by James Phelan. Can Sam and his allies unlock the secrets of an ancient journal to reveal their final destiny? Sam is far from home, with the fat This is it. My nightmares have finally come true. To ask other readers questions about Eleven, please sign up. how can I download this for kindle? What is the plot mountian of the story? 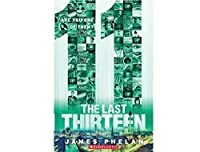 The Last Thirteen: 11 is another fun addition to the exciting series about teens that have true dreams about the future, and then are able to make changes to what they saw as a dream unfold into real life. At the beginning of this book, we only know who two of the last thirteen are: Sam and Gabriella. Who will be the next of the true dreamers to be found? Well, it was hinted in the last book and it comes to fruition in this book. Xavier Dark is the third of the last thirteen to be discovered. Xa The Last Thirteen: 11 is another fun addition to the exciting series about teens that have true dreams about the future, and then are able to make changes to what they saw as a dream unfold into real life. At the beginning of this book, we only know who two of the last thirteen are: Sam and Gabriella. Who will be the next of the true dreamers to be found? Well, it was hinted in the last book and it comes to fruition in this book. Xavier Dark is the third of the last thirteen to be discovered. Xavier is a classmate of Sam from his school and he is also the son of Dr. Dark, Sam psychiatrist. Sam and Xavier were not exactly friends in school, but they are quickly becoming best buds as the fly around the world. I was happy to find that Xavier was the latest last of the thirteen to be found. I was actually hoping this would be true while I was reading The Last Thirteen: 12. Most of this story takes place in Germany as Sam, Xavier, and Xavier's father, Dr. Dark, search for the missing gear. Enterprise is desperately seeking Sam and pulling out all the stops to nab him. Since Alex has joined Enterprise, the reader no longer knows if he can be trusted or if he really wants to help out Sam in his quest. Eva has been left behind at the Academy and ends up having a true dream about a campfire she sees out in the snow covered-mountainous forest. She makes a bad decision and decides to investigate the campfire on a snow mobile by herself. She should know better than going out into a harsh environment alone. It can get you killed. Solaris is hot on the trail of Sam too, and he has a mole inside Enterprise helping him track down the ever-elusive Sam and Xavier. Will Sam and Xavier be able to evade Enterprise and Solaris while searching for the missing gear? 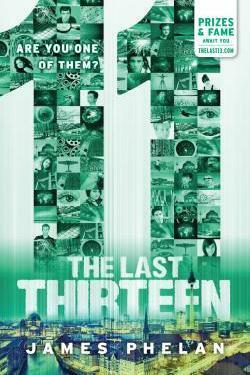 Young readers are sure to be entertained by The Last Thirteen series. The books are packed with action, adventure, and a bit of mystery. I have read some reviews of this series and I see reviewers talking about the lack of character development and some other other things. Then I think to myself that, yes, this may be true to a certain extent. But, this is a book intended for eleven year olds and up and they don't require really getting to know the deep, driving feeling of a character. This is an action adventure series and what the young readers require is action, and plenty of it. If they wanted a boring, explore your feeling type of book, they wouldn't be buying this series to read. I love action adventure books that read quickly and fill the reader's head with exciting chase scenes, daring escapes, and mind-boggling adventure that gets the old ticker pounding. All of these things are in this book. And sure, there may be some misunderstood feeling going on with some of the girls. Eva appears to being slightly jealous of Sam possible infatuation with Gabriella, but Sam isn't really paying attention to either of them right now. He is busy trying to save the world by tracking down the last thirteen. Who has time for romance? No Sam! Overall, The Last Thirteen: 11 is a great story that kept me flipping page late into the night and waking up early to get some good reading in before my day started. I really enjoy all of the characters in this series and cannot wait to see what happens next in The Last Thirteen: 10. If it is as exciting as the first three book have been, then I'm guaranteed to have a good time. I cannot wait! I really enjoy reading this series but especially this book. This book was very engaging and I really enjoyed reading this book. In this book the main characters are always involved in the action. No matter which city or country they are in they are always fighting evil. This book always has a twist and you can never be sure what is going to happen next. Sam and Xavier (the main characters in this book) are always on another mission to find the missing pieces to the bhaka. I really enjoyed this I really enjoy reading this series but especially this book. This book was very engaging and I really enjoyed reading this book. In this book the main characters are always involved in the action. No matter which city or country they are in they are always fighting evil. This book always has a twist and you can never be sure what is going to happen next. Sam and Xavier (the main characters in this book) are always on another mission to find the missing pieces to the bhaka. I really enjoyed this book because you never know who the good guys are and who the bad guys are. In this story there are lots of self-fulfilling prophecy's, these prophecy's are one of the reason why this book has a lot of fantastical elements. This story is about people dreaming the future and then taking part in missions to make these prophecy's come true. Each mission that Sam and his colleagues take part in is in order to find another piece of the bhaka, a gate made by da vinci that will lead to an ultimate treasure. Great book very adventurous. Filled with action. can't wait to read the next in the series. I am reading this series aloud to our preteen and teenage kiddos. So far I liked Book #2 the best, but now in book 3, we're really beginning to piece some of the story together, and yes, it leaves you hanging, so have book 4 handy! This series has a really interesting plot and ideas, I especially like how things fall into place like puzzle pieces. While each book is rather short and always ends in a cliff hanger- making you NEED the next book, it's fast-paced and keeps you wanting more. More happenings in book three, but they really bleed into each other, I guess it is one long book spit into thirteen parts, but already it is becoming a bit repetitive at book three. it was a great book and I am excited to red the next book i the series. Now this book got me thinking of RPG games. Once you get more stronger, so do the emeines. My mind just flew to China reading this. This one got a little stale, took a while to get through. We continue our adventures with Sam and the rest of the Dreamers in Eleven, the third book in The Last Thirteen series. Sam is a Dreamer - he has true dreams and is prophesied to save the world from unimaginable horror with twelve other true dreamers, who are all 15-16 year old kids. The last book ended with a cliffhanger where Sam is surrounded by German Guardians who have turned traitor. The German Guardians are dispatched quickly and easily, with Sam performing some physics-defying stunts on h We continue our adventures with Sam and the rest of the Dreamers in Eleven, the third book in The Last Thirteen series. Sam is a Dreamer - he has true dreams and is prophesied to save the world from unimaginable horror with twelve other true dreamers, who are all 15-16 year old kids. The last book ended with a cliffhanger where Sam is surrounded by German Guardians who have turned traitor. The German Guardians are dispatched quickly and easily, with Sam performing some physics-defying stunts on his scooter (seriously, the rules of physics are optional for this guy! ), and we're soon off adventuring to exotic locations with Sam and his friend Xavier, who is one of the Last Thirteen. Xavier's had a dream which takes the duo to Berlin, where they easily fool adults into thinking that they hold PhDs, with Xavier posing as his own father, and steal a vital clue into the mysteries of the Last Thirteen. I liked that the world has finally expanded, and a lot of the mysteries surrounding the Professor, the Enterprise and Xavier's father have been cleared up. It's also pretty cool to learn the two prevailing theories about what makes a Dreamer: nature vs. nurture. The importance of Da Vinci is interesting: I'm finding myself drawn in evenas I sigh in exasperation at the Da Vinci Code for middle-graders vibe. Plot elements are falling out rather conveniently in this story, which is perhaps understandable given that it's aimed at younger readers, but they still concern me. A little complexity wouldn't be unwelcome. The prevalence of dart guns also gives me pause (all the shooting that none of that messy blood and dying) because in a real race to save the world, people will be hurt. The real-world implications of the actions Sam and his friends take are never considered - where are the international condemnation and political power-plays? I still find Alex's role in the story interesting, although it's not shaping up to go in the direction I'd predicted in the last book. I'm looking forward to see what impact he has in future books, and watching his relationship with his mother develop. Of all the kids in this series, only he and Xavier have positive relationships with their parents. Xavier has always struck me as important to the plot, and the development that he is Dreamer came as no surprise. His life has been more difficult than it seems at first glance, and I'd like to see that developed so that he doesn't just come across as an insanely rich and connected teenager with a tragic past. On the other hand, Eva has quickly been reduced to an annoying character. She's mooning over Sam and getting irrationally angry at Gabriella, who is beautiful and famous and charismatic, just because Gabriella has a crush on Sam too. Sam, who really hasn't looked at either of them with interest and is certainly not thinking about them while on his mission. I don't know why the boys get to have all the adventures and the girls sit around worrying about them and unnecessarily getting into trouble by making silly decisions, but I'm not enjoying it. Overall, the world James Phelan has created is shaping up well, and although I can think there is room for improvement, I'm enjoying them too. This fast paced series about the power of dreams, ancient artefacts and a race against the clock will entertain younger readers. Pick up these books for your children, nieces and nephews, and other young relatives! You can read more of my reviews at Speculating on SpecFic . Sam is still racing to find the others in the Last Thirteen. Little does he know that he's already met some of them, and that some of them might already be in the hands of the enemy. Sam comes face to face with Solaris again in this cliff-hanger. You know it's going to happen. I feel like none of these novels would be complete without a Solaris en This review has been crossposted from my blog at The Cosy Dragon . Please head there for more in-depth reviews by me, which appear on a timely schedule. Sam comes face to face with Solaris again in this cliff-hanger. You know it's going to happen. I feel like none of these novels would be complete without a Solaris encounter. It's an interesting concept that they can change the future by being aware of it. I've read a lot of books with interesting instances of time-travel/seeing the future, and what this can do to people, and this isn't particularly a new concept. It's treated well enough however. I wonder also whether different people have the same dream, more often than just Sam, and his newly-rediscovered friend. I hope to see more of it in future books. This novel fills out what they are actually looking for and adds an interesting touch of history. It's such a good thing they appear to have lots of money, because Sam has a serious case of jetting around the world! You'd think he's stick in one spot and get on with it. I want to keep reading these! I'm not quite hooked, but this novel felt like it had more meat in it than the others, and I'd be really happy to see more of it happening. The Last Thirteen is a fun, adventure series that's ideal for preteen readers. It follows the story of Sam, a boy plucked from his science class and thrown into a world of reluctant superheroes, secret training facilities and a race of children known as The Dreamers. In the same vain in which the Twilight series brought mature young adult readers back to books, The Last Thirteen is perfect to reintroduce reading to middle grade, preteen boys. Although Ava's character seems to be more invested in Sam beyond their friendship, the series to date is age appropriate for target audience, no inappropriate language, mature themes or romance, which is sure to appeal to boys. Third book into the series and I'm still intrigued where this is going. We got a little more detail in this one about the Professor, Jack and the Dreamers which was good - I actually like explanations for things like this! I want to understand why things are the way they are but in these books things have happened so quickly there hasn't been time for it. Sam locates another of the Last 13 - who has been there almost all along. I thought this may be a little too easy until I considered the "natu Third book into the series and I'm still intrigued where this is going. We got a little more detail in this one about the Professor, Jack and the Dreamers which was good - I actually like explanations for things like this! I want to understand why things are the way they are but in these books things have happened so quickly there hasn't been time for it. Sam locates another of the Last 13 - who has been there almost all along. I thought this may be a little too easy until I considered the "nature vs. nurture" argument that is discussed in the book and figured that in the circumstances, it does make sense. Alex is starting to get on my nerves, and Eva seems to be in a bit of a mood because she's being told to stay put. Eva, there is a reason you don't go out climbing mountains by yourself in the middle of the night! Sigh. I hate stupid characters and as we now have the books from both of their perspectives now as well as Sam's I hope it improves! The only other thing is I don't think any of the characters are emotionally mature enough for what they're doing, which definitely shows. I only hope their guidance under the Professor, Lora and Dr. Dark keeps them on the right track. This was probably my favorite book of the series so far. The books are becoming more and more interesting as they progress. The characters become stronger, and you learn more and more about them. I like how you get to read about everyone, not missing any part of the story. I find it interesting that we get a new character, but we don't seem to lose any of the other characters. I really like Sam and Xavier and their interactions with each other. There are still the issues with too many "so and so This was probably my favorite book of the series so far. The books are becoming more and more interesting as they progress. The characters become stronger, and you learn more and more about them. I like how you get to read about everyone, not missing any part of the story. I find it interesting that we get a new character, but we don't seem to lose any of the other characters. I really like Sam and Xavier and their interactions with each other. There are still the issues with too many "so and so said" but this book seemed to have less, instead using different ways of expressing that. I do like how the books have Sam and his friends traveling around the world. This book is about 13 people that are trying to save the world with their dreams. Sam, Xavier, Gabrielle and Eva, So far they have found 3 of the last thirteen. Xavier the boy they found is part of the last thirteen. They are being chased by Solaris that will try anything to kill them. They get into a zoo and try to find the missing parts of the prophecy to save the world. The main idea trying to get to the readers is to keep moving forward. I know this is the theme because when Xavier goes on without his dad he focused on trying to find the missing part of the prophecy. All of them also had to go with the flow and not look back. While Sam and Xavier were out looking for clues the others were doing other important things. Like when Sam was saying we have to go back, Xavier refused and said "move forward". Este livro, tal como os outros da série, foi muito rápido. Por ser muito curto, teve toda a acção condensada e os acontecimentos deram-se com muita rapidez, o que tornou o livro uma pouco confuso para mim. Não é que não dê para perceber a história, mas parece que nos são atirados todos os acontecimentos e explicações de uma vez e quando acaba o livro ficamos a pensar: "wow o que é que acabou de acontecer aqui?". Mesmo assim vou continuar com a série porque fiquei curiosa para saber como vão dar a Este livro, tal como os outros da série, foi muito rápido. Por ser muito curto, teve toda a acção condensada e os acontecimentos deram-se com muita rapidez, o que tornou o livro uma pouco confuso para mim. Não é que não dê para perceber a história, mas parece que nos são atirados todos os acontecimentos e explicações de uma vez e quando acaba o livro ficamos a pensar: "wow o que é que acabou de acontecer aqui?". meeting solaris was horrifying enough, now what? sam's biggest fears are coming true, meeting solaris, doing head to head against enterprise and now his guardians have betrayed him. now his only team is the academy and xavier and dr. dark. sam's far from home but can he still unlock the secrets of an ancient journal by da vinci?? Book 3. Matthew Reilly action for tweens and teens! The rollicking survival story continues, as each of the 'Last 13' is discovered, and must use their nightmares to unravel the quest to save the world. Xavier Dark is finally revealed for who he truly is, new Dreamer Gabriella is discovered, and the treachery and greed for power continue to undermine those in The Academy and their quest for survival. The action continues, and the plot begins to widen, with the perspective of each 'side' in the race for the last 13 told through the different characters. More history and facts begin to emerge in this book, and the good versus evil line is starting to blur. Phelan is adding an additional layer of complexity with each book in this series, and the cliffhangers continue! I enjoyed this book a lot. It had more action in it and I like how the characters such as xavier and Alex and Eva are involved in the story more. The only thing I disliked was the fact that gabriella was barely in the book considering she is part of the last thirteen. Quick to read thriller series with twists in every chapter. I love the series and everything about it, but sometimes the books tend to drag on a bit and slow down. This series continues to improve as it goes on. The pace has picked up and Sam's role is clear. The identity of Solaris continues to be a mystery. The least exciting of the three I have read of the series so far. But in general it was full of adventure. Once again another great book in the series. Once again quite short. But it is a seriously good series! an excellent read, Sam faces more danger and betrayals, and the stakes are higher. Will he survive? James Phelan is the award-winning author of twenty-four novels and one work of non-fiction. He first studied and worked in architecture before turning to English/Lit, working five years at The Age newspaper, obtaining an MA (Writing) and PhD (Young Adult Literature). Hachette has published his five geo-political thrillers: FOX HUNT, PATRIOT ACT, BLOOD OIL, LIQUID GOLD and RED ICE. From 2010-2011, H James Phelan is the award-winning author of twenty-four novels and one work of non-fiction. He first studied and worked in architecture before turning to English/Lit, working five years at The Age newspaper, obtaining an MA (Writing) and PhD (Young Adult Literature). From 2010-2011, Hachette published the widely acclaimed ALONE trilogy of Young Adult post-apocalyptic/dystopian novels. In 2013/2014, Scholastic published James' thirteen-book adventure series about the dream work THE LAST THIRTEEN. The multi-award winning series (2014 YABBA, COOL, KOALA awards) has been highly successful around the world, selling over a million copies in 18 months. THE SPY (Hachette, 2013), was the first instalment in a new series of suspense thrillers with the protagonist Jed Walker, and is followed by THE HUNTED (2015), and KILL SWITCH (2015). James is currently working on a follow-up trilogy to THE LAST THIRTEEN, more thrillers, and an illustrated middle-grade series titled GRANDPA SPIES.